The Welch Allyn Handle 3.5v Diagnostic Set with Ophthalmoscope, Pneumatic Otoscope, Rechargeable Handle, and Hard Case (Model 97120-M) is an excellent choice for performing basic physical diagnosis. The otoscope features our exclusive Halogen HPX lamp, providing brighter, whiter light than standard halogen lamps for true tissue color and long-lasting illumination. Built for durability, ease-of-use and comfort, these instruments will provide you with lasting satisfaction. 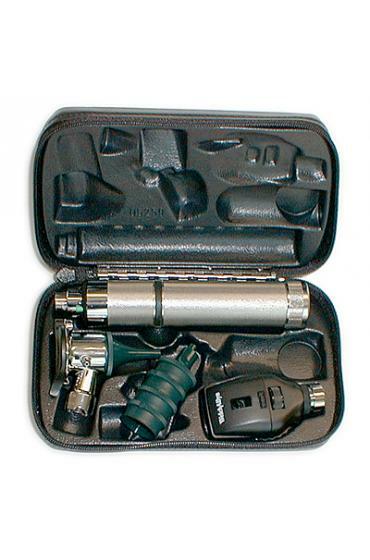 Key Components: 3.5v Standard Ophthalmoscope (Head Only) 3.5v Halogen Lamp 3.5v Pneumatic Otoscope without Specula (Head Only) 3.5v Halogen Lamp Reusable Polypropylene Pneumatic, Operating, and Consulting Otoscope Specula, Set of Five 3.5v Direct Plug-in Rechargeable Handle Replacement NiCad Rechargeable Battery (Orange) for 71000-A Hard Case for 3.5v Set Warranty: Welch Allyn will repair or replace, free of charge, any parts of its own manufacture proven to be defective through causes other than misuse, neglect, damage in shipment, or normal wear. 3.5V Ultra-sealed Pneumatic Otoscope with fiber optics for a cool light for accurate and comfortable examinations.